We weren't sure about this tbh, all the publicity around the show and its marketing seemed a bit mainstream. not that the cakes are super alternative, but we just thought it may be a bit Cadbury’s purple chaircovers etc. And it was pretty much, but we had a brilliant response from visitors and came away with hundreds of emails. We had a great position, just inside the entrance, and the cakes really stood out against the distressed canvas backdrop that we painted in the garden the previous weekend. The old sideboard that I bought on Facebook Marketplace for £80 and painted (badly) with chalk paint also looked way better than i had imagined. 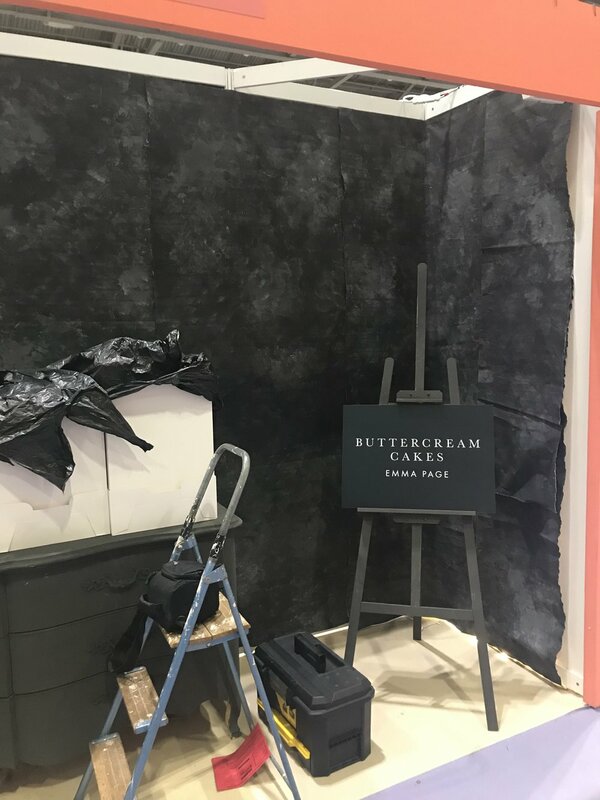 Unfortunately the backdrop fell down a couple of times, which was a huge pain, but nobody was really looking up at the ugly reems of gaffer tape that evolved into a huge sticky mess by the end of the second day. The offer of a free dummy tier (still available if you sign up for the newsletter) was snapped up by lots of couples who seemed genuinely blown away by the cakes. We had some amazing feedback and have already taken several orders from visitors who have been in touch since. People are always so surprised by how versatile buttercream is. The sculpture cake particularly turned heads. We handed out 300 decorated mini cupcakes and 500 business cards over the weekend. Packing up was hard work without a trolley - promised Anna and Miranda who helped that I would invest in one for the next show, as carrying a very heavy sideboard through two exhibition halls was very hard work. Why don’t more people get married in January? To be fair, everyone’s skint and not drinking, but how fun to have a wedding to break up the relentless monotony of Netflix documentaries and frenzied housework because the low sun (sorry to sound ungrateful) makes everything look so bloody filthy. I really couldn't wait to get started on Fay and Rob’s wedding cake, after a break from caking for a couple of weeks; mainly because I knew exactly where I was going with it. And secondly because it was mainly vanilla Madeira. Touch. I first met the couple over a coffee in Bluewater exactly a year ago. Fay’s a graphic designer and had created beautiful wedding invitations herself, based on a contemporary arrangement of cut-out roses and ferns against a dark green background, printed on beautifully soft thick card. This design was to inform the seating plan, venue signage and even the little round stickers the couple had fixed to hundreds of cake boxes so that guests could take a slice of cake home. I took a sample invitation away with me and did a little dance about the fact that the couple had chosen Amanda of Distinctly Floral as their wedding florist. The invitation was pretty much all I needed to design their cake, but Amanda is always super helpful and would be able to give me a full list of the flowers she was going to use closer to the date. To be fair most florists will send over a lost of the flowers they are using (apart from one who just replied ‘pink’), but they’re manic just before a big wedding. Instead of sending over a sketch of how I imagined their cake to look, I sent Fay a photo of a tiny section of cake dummy that I’d quickly frosted in the colours of the invitation. “Too dark?” I asked “No love it.” she replied. And that was the sum of the consultation process, apart from a quick exchange of emails in which I repeatedly assured Fay that there was absolutely NO WAY ON THIS EARTH she’d ever find a log slice with a 16in diameter (she did of course, pretty much straight away). I had a panic the night before delivery, that I’d overdone it with the ferns. 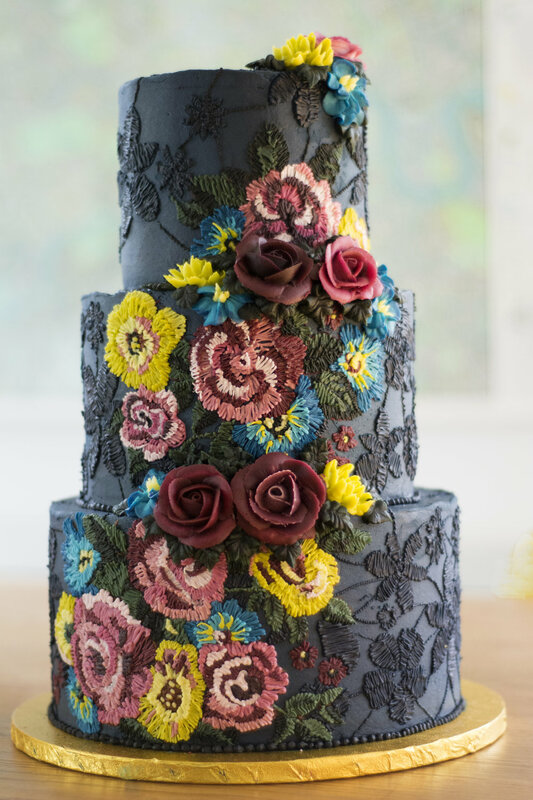 They really dominate the design of the cake and I was worried that Amanda would simply use them as complementary foliage for the roses and anemones she was using. 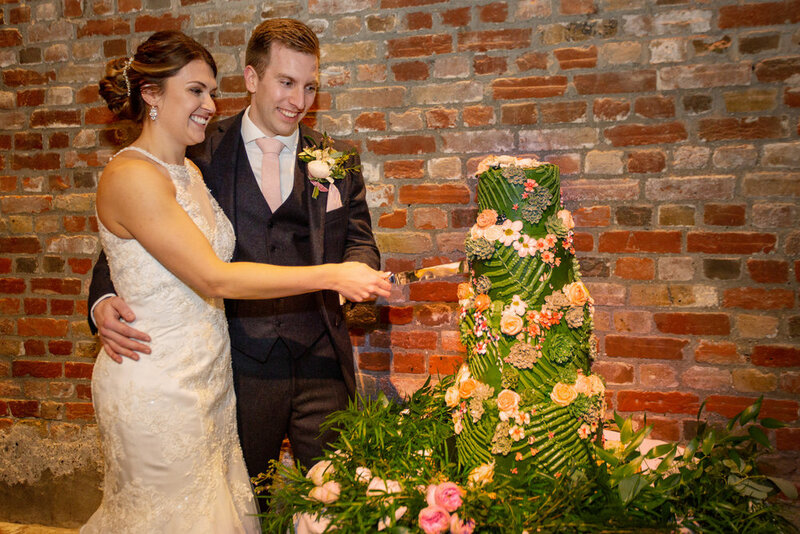 They work well on the cake: any element that travels diagonally between the tiers will bring a design together, and in this case their linear curve prevented the cake from looking ‘dotty’ with lots of mainly round blooms. But I always fixate on something and it’s always fine. And ferns were everywhere! What a fabulous display. Amanda had absolutely transformed the venue (Cooling Castle Barn in Rochester) into an enchanted woodland space, as you can see here. I was over the moon. The cake was happy, and look at the magical smiles on Fay and Rob’s faces!!! The couple had a fabulous day with their friends and family. All Fay’s attention to detail paid off beautifully. 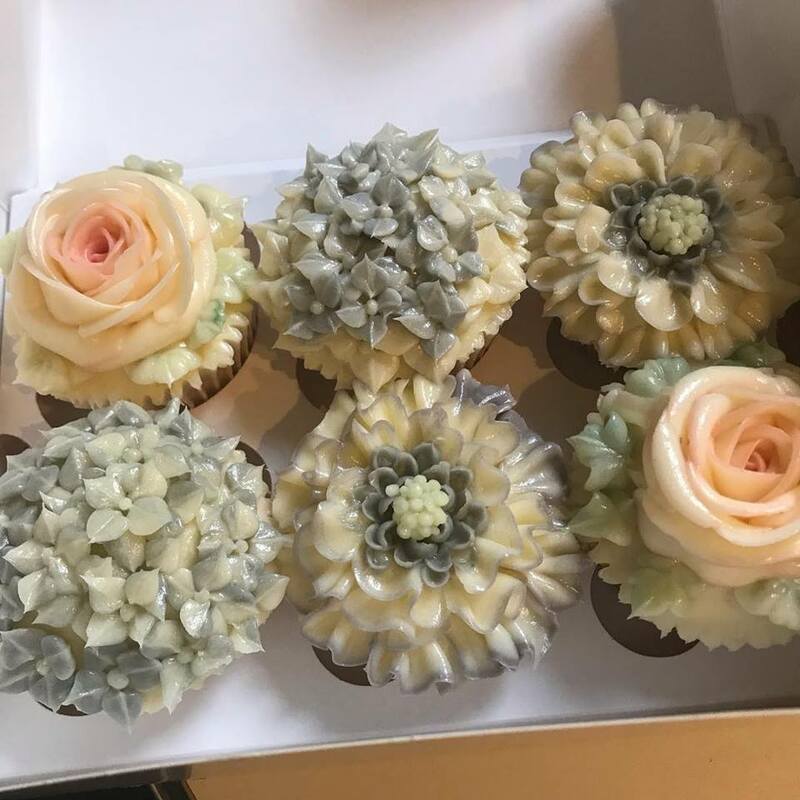 She had even asked me to make a dozen succulent cupcakes for guests who were flying home after the wedding and so couldn't take away the real little succulents that the couple had planted up in dinky little glasses as wedding favours. The children had matching cactus cookies and even the colouring books were on-brand. Very impressive, and very pretty. What a joy to work with a couple who have a clear vision of their wedding. And who are super organised. And who have a good florist. And who appreciate really good quality card stock. I still get the invitation out from time to time and give it a little stroke. Unless you’ve been in suspended animation for the last four decades, you’ll have realised by now that you don’t have to have a traditional fruit cake covered in marzipan and decorated with royal icing on your wedding day. Here are some other myths surrounding wedding cakes. Wedding cakes are always FONDANT and I hate fondant. I’ve not been asked to make a fondant cake for five years. Fondant is well and truly on the way out. As well you know. Next. 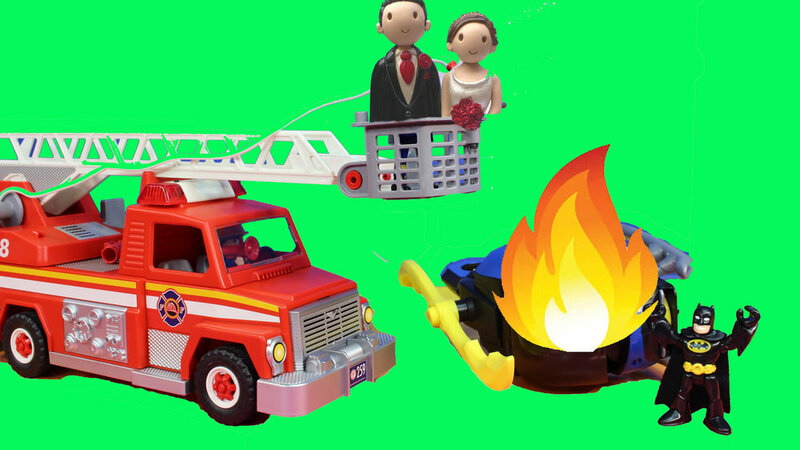 CAKE TOPPERS are original, witty and communicate the whackiness of the couple getting married. No. A pair of minions, Lego deep sea divers, unicorns, beer bottles....all rubbish attempts to convey humour using hideous primary colours, which will ruin every photo taken inside the venue. Everyone gets a TEENY TINY piece of wedding cake: it’s just a tradition and not really part of the food story. All cake is food. A buttercream wedding cake is entirely delicious and everyone needs to have a big frosted slice for their pudding. There are hundreds of different sponge and filling options available. You cake maker will have worked hard to ensure that each is fantastic. Eat it all. Also, you’re looking at paying around £5 per portion of a beautifully decorated centrepiece dessert. Your caterer probably won’t dish up trifle for that. A buttercream cake will MELT in the summer. It definitely won’t. We all work with different types of stable buttercream, which will stay put for hours, unless you blast it with a hairdryer. Wedding cakes are WHITE. I made just two white wedding cakes last year. A white cake needs so much texture for any design to stand out in photos because you’re relying on light and shade for it to make sense. Use your cake to bring together the colours of your wedding flowers, or the palette used in your stationery. A white cake will slip into the shadows like meh. We only need a LITTLE CAKE because we have an intimate wedding with 40 guests. Build it up with dummy tiers. A good cake maker will tell you the most cost-effective way to do this - it may be to add a little fake tier at the top or a big one at the bottom. Worth doing if you want your cake to have some impact. Mini rose cupcakes make a perfect dessert canape, £1.80 each, minimum order 24. They’re not actual flowers. Your host wont have to unwrap them, trim the ends and grapple with a stupid flower food sachet that will only come away from the cellophane if they cut the sellotape with scissors so it dribbles all over their £310 Anthropologie dress*, find a vase and fill it with water in the sink where the beans are being refreshed in iced water. While the canapes burn to a crisp in the oven. Delicate flowers piped in Italian meringue buttercream, £3.65 each, minimum order 12. Thery’ re a bit grown-up, beautiful, and delicious, but also whimsical and cute - a reflection of your ideal dinner party (arrival) self. They’ll double up as a celebration cake for the birthday that the dinner is in aid of, and that you’ve forgotten. This sitch will never unsettle me in the slightest: not only do I always take cupcakes to everything - even Kettlercise - I wouldn’t leave the house without a packet of cake candles. 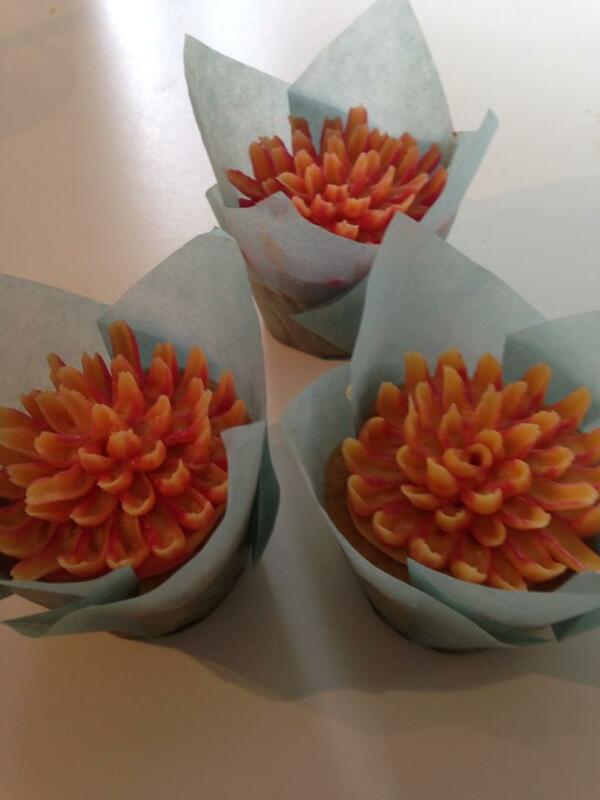 Mini succulent cupcakes, £1.80 each, minimum order 24. They can be frozen. Well buttercream cupcakes can. As if anyone reading this would ever be tempted to buy fondant cupcakes lol. You can mix and match the flavours and designs to suit the occasion. A couple with two young children will love a mixture of exquisite flower cakes with a couple of dogs thrown in. Or foxes, or pigs. Owls even. Or neon fluffy monsters. Piped American buttercream animal cupcakes £3.65 each, minimum order 6. Your nana says to have a traditional wedding cake. She still has the yellowing silk flowers that adorned the top of her royal-iced cake in a travel sweet tin. A royal iced cake is hard to come by these days, so conventional folks opt for fondant. But this is changing. Buttercream is rapidly replacing fondant as a cake covering. Here’s why. It will be cheaper. 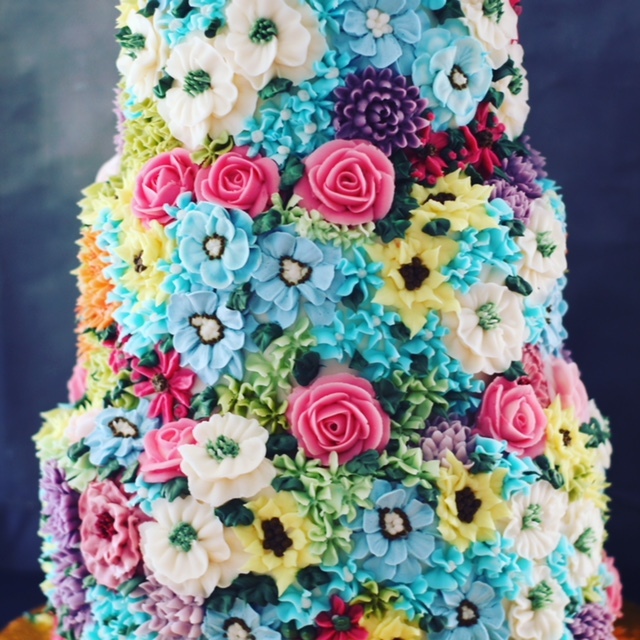 A fondant cake is crumb-coated in buttercream, chilled and covered in rolled sugarpaste, which then has to be smoothed and decorated with, say, sugar flowers - all hand-modelled from expensive flower paste, wired, dried and finished with paint or petal dust. A buttercream cake is also crumb-coated and chilled, but then frosted with a palette knife and, once scraped smooth, the decoration can be piped on pretty much straight away. The whole process is way quicker, which is why it’s cheaper. Also buttercream cake makers are all super nice and will never overcharge. Such a simple cake, but how delicious does it look? It will taste better. Cheffing at weddings in historical times, I noticed that after service, the cake plates were returned to the kitchen loaded with uneaten fondant from the wedding cake. Literally no-one eats that stuff. Buttercream is delicious. If you think American buttercream is too sweet, there’s Swiss meringue buttercream, and if Swiss meringue buttercream is too buttery, there’s French meringue buttercream. Or if that’s too rich, Italian meringue buttercream. People who don’t like buttercream are weird and you don’t want them at your wedding. They probably don’t like puppies or holidays either. You can eat all of it. Unless your buttercream wedding cake is dressed with fresh flowers, or some daft topper made out of clothes pegs or something, you can eat your whole cake. Sugar flowers are rock hard and you can’t eat them. They’re for putting in the box that someone gave you a coffee grinder in and stashing in the loft for you to discover and moon over when you pack to go into an old-people’s home. It will look fun. Even the most elaborately-piped buttercream confections have bags of character and never look boring. Piping is high-risk - once you’ve made a mark it’s not coming off - there’s nothing cautious or tentative about it, which is why buttercream cakes have a spirited style about them that you couldn’t achieve with fondant. Price Harry and Meghan’s buttercream wedding cake: elegant, stylish and delicious-looking. It’s like well trendy. ALL the good cakes are buttercream. For example, Harry and Meghan, Elvis and Priscilla, Tom Daley and Dustin Lance have all chosen buttercream cakes for their big day. Say no more. So lovely Sydney sent me a message. She’d seen an image on Pinterest of a stained glass cake I’d made while training with Queen of Hearts Couture Cakes 100 years ago and wondered if I could replicate the design of a glass lampshade her father had made when she was little. Here are the sketches I drew for them. The design was fairly straightforward; not too much detail, which is good, because this type of finish is achieved by working with piping gel on a soft buttercream background and the gel has to be coaxed about very carefully. The biggest challenge with working on a buttercream base is that, even when it has crusted, it remains soft under the crust and it’s really easy to gouge. Also, with a smooth cake, there can be no bumps or bands of piping between the tiers because there’s no piped detail to conceal them. I find transferring a tracing of a design onto a cake, using a piped outline traced on parchment and then pressed onto the cake, quite stressful. If the paper slips you get an ugly blurred line that will be impossible to cover up. Also, once the icing has crusted to a stage where you can work on it, the piped image won’t adhere to it at all. So I just go for it freehand, describing the outline tentatively in gel and then filling it in in stages. It looks shocking at this stage, really ugly, but once you start piping the black outlines itn comes together really quickly. There you go. If you can recreate stained glass with buttercream the sky’s the limit really. 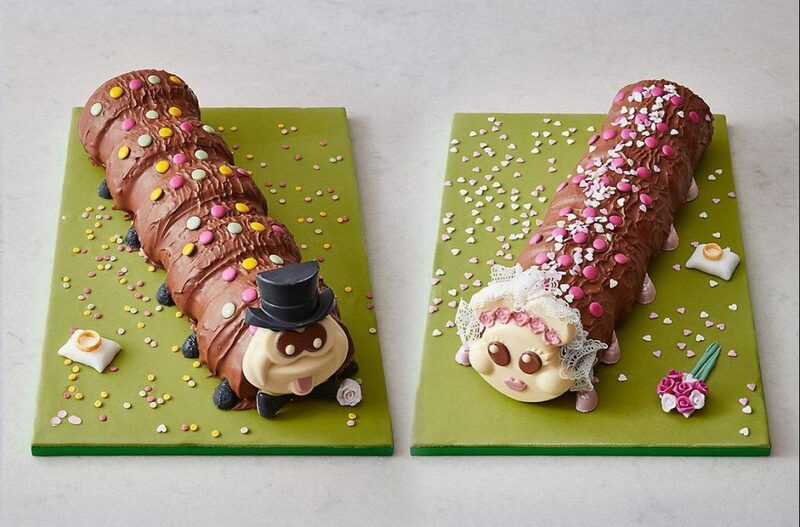 Colin the Caterpillar Cake recently married girlfriend Connie, rendering the (pretty much always desperate) quest for a single gender-neutral supermarket cake impossible. In a few centuries' time, when we all have to wear concrete Heelies to traverse the radioactive soil, women will still be receiving fondant Louboutin stiletto cakes for big birthdays, like kids you see nowadays chatting into Chatterphones. 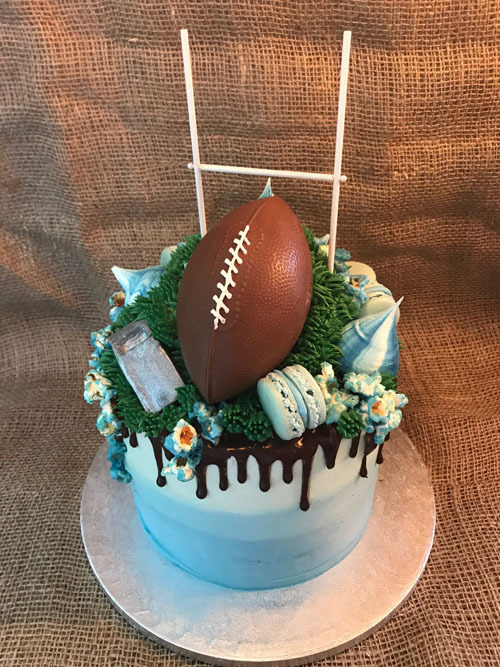 When customers want a man cake, there has to be a ball. Of course a skilled fondant baker could craft a seaworthy catamaran or a whole hockey team with jointed limbs, but my one effort to pipe a rugby scrum resulted in a pile of squirmy soft-shelled turtles. And smoothing the frosting on a VW Beetle became so distressing that a friend had to take two days off work to counsel me through it. So it's a relief to have a ball to play with really. This super rugby ball was supplied by www.welshchocolates.co.uk. It weighs a ton (no wonder the lovely lady I dealt with was so confident about it surviving the post, it's almost solid) so I've supported it on a dowelled board. The drip cake is a perfect format for mixing up motifs. Because it's so chaotic, there's no expectation of scale or realism. 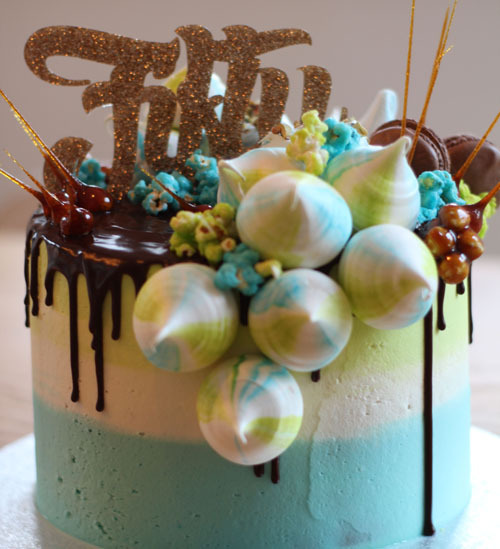 Even a drip cake without a ball is man enough. A riot of meringues, candied popcorn, chocolate shards, macarons and sweets, maybe topped off with a blazing firework candle for maximum macho effect. We'll challenge gender stereotypes tomorrow. With rustic buttercream cakes on trend, couples are returning to toppers as a fun and personal way of dressing their centrepiece. Let's be clear, we're NOT talking about those little clay cartoon figures that wouldn't look out of place in a Playmobil fire engine. Toppers now include tiny balloons, witty glitter exclamations, light bulbs and gold dinosaurs. A couple I made a cake for recently had a 3d printout of themselves made to top their wedding cake. It was around £200. Not everybody's taste but a fantastic and spookily detailed keepsake. This is a favourite . Little foil balloons add humour and glitz: perfect if you've got gold accents in your theme, and way more affordable than adding edible gold leaf to the cake itself. Pretty tassel toppers (look on Etsy) will bring a range of colours together to enliven a rustic cake, with or without flowers. Mix metallics and pastels when thinking about styling a marquee with pom poms and fringes and duplicate the effect in miniature on your cake. Bang on trend, this an urban geometric heart is handmade and featured on the-little-wedding-corner, a German wedding blog. Pinterest is choc-a-block with ideas and tutorials for wire decorations and accessories; any of them can be scaled down with florist or craft wire. Perfect for a winter or candlelit celebration, and a grown-up take on introducing metallics. Don't like the fondant triangles though. For a neo-industrial look, how about these quirky lightbulbs, found on ruffled.com? Brilliant foil to the blowsy anemonies and peonies arranged around them. If you fancy a bit of script, make it witty and unique, rather than Mr and Mrs whatever. 'Light of my Life' works well here because of the irony but would seem a bit lame without the lightbulbs. I quite like 'Finally' here, but it's a bit hackneyed now. As a guide I'd avoid any topper on Etsy that comes up as most popular. Make up your own if you can. Maybe a fragment of a song or something. Why not make your own? Or ask your cake maker to. We all love a challenge and sometimes it's fun to make stuff that doesn't generate washing up. This simple heart would look perfect topping a rustic buttercream cake. It's rustic but delicate, and the tiny leaves of the evergreen thyme won't wilt. Your florist could do this for you if a family member is making your cake. The thyme could be repeated in sprigs between the tiers to bring the design together. Something fun that could be made in advance: plastic dinosaurs sprayed with gold Plasticote and dressed in their wedding finery: perfect for a pair of archeologists! These two are from Etsy but it's an easy DIY. Have a look at my Pinterest board for other ideas https://uk.pinterest.com/emma0262/cake-toppers/. Happy New Year! And congratulations to couples who became engaged over Christmas. Choosing a wedding cake may be relegated to a back burner while you sort your venue, bridesmaids, honeymoon and DRESS, but many cake designers will be booked up well in advance so it's worth having a think about it in the early days of planning. After deciding if you want to have your cake as a pudding, a centrepiece, both, huge, showy, rustic, made of cheese (please no) or whatever, sooner or later you most probably need to declare an allegiance. Do you want a fondant or buttercream cake? A well-made fondant (also known as sugarpaste) wedding cake will be perfectly smooth. The detail will be accurately placed. Any sugar flowers will appear to be absolutely real, they may even have spots of dew on the petals. 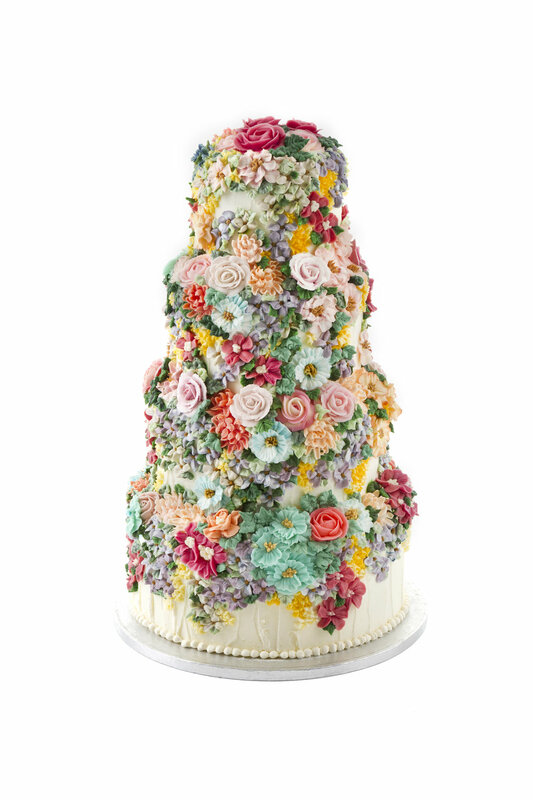 Look at this one by famous London cake maker Peggy Porschen. It's perfect. No bumps or tears in the finish. Elegant and beautiful; the flower detail is balanced and the whole design is light but very grown up. One thing to bear in mind with fondant is the taste. I have cooked at many weddings and the fondant left on plates after service can fill a black sack. One of the reasons couples opt for a buttercream cake is that they don't like the thin oversweet taste or synthetic mouthfeel of fondant. And there's loads of it in every forkful. Another consideration is fashion. The real images on any wedding blog will reveal that a huge change in taste has taken place in wedding style over the last decade. Couples and their families are investing more in the fun and personal elements that they can bring to their day, over the stiff formality and etiquette that would traditionally structure proceedings. Not in a bodgy Heath Robinson sort of way, but with character and charm. Guests are no longer commanded to line up in endless group arrangements for formal photos; photographers prefer to mingle and capture natural moments that tell a story of the day. Flowers are hand-tied, in-season and in jars; no longer stiffly arranged in cubes of oasis; and the seating plan may be scribbled on a blackboard. There's fairy lights and neon, candles and copper pipes and pallets and all sorts to look at and enjoy. And I just don't feel that an immaculately-iced indifferently-tasting cake fits in to this new aesthetic at all. For this reason, and over the last few years, naked cakes have become popular. They suit rustic, spare or romantic spaces. They're inexpensive and can be decorated with fresh flowers, fruit and sparklers. What's not to like? Well they're a bit old hat now. Also, they're only really that effective if red fruits are in season. They dry out really quickly unless someone sprays syrup all over the exposed sponge every hour. And fresh flowers have to be wired properly and inserted into the cake with food-safe picks. They can't just be poked in. Even then, most fresh flowers will wilt within a couple of hours, unless they are robust, like roses and baby's breath. Which brings us to buttercream. Crusting buttercream is more versatile than you would imagine. It can be piped to recreate elaborate floral bouquets, tapestries, lace, stained glass, baskets and even wood. The most fashionable bakers in the world - Cakes by Cliff and Katharine Sabbath in Sydney for example, are all using buttercream to create showstopping drip cakes dressed with meringues, macarons, glossy rainbow popcorn and piped flowers that are full of character and fun, beautiful to look at and completely delicious. Contemporary ombre and rustic effects suit every venue and be dressed up or down, with ganache drips, gold leaf, piped or fresh flowers and quirky toppers, often for a lot less than you'd expect to pay for a fondant cake of the same size. Buttercream is also perfect for elegant and traditional designs, which can be worked up from the tiniest fragment of an inspiration. Because the detail is piped rather than moulded, the end result has a spirited and dynamic style that is full of character and drama. And tastes delicious. No icing on plates. If there's a wedding cake to suit every couple, every venue and every budget it has to be a simple three-tier rustic buttercream dressed with fresh flowers. The frosting provides the perfect foil for statement blooms or modest meadow flowers, but unlike the pure polar white surface of smooth fondant, it has a character of its own. This is a cake dressed with soft blush and dusky pink roses by Amanda at Distinctly Floral that we displayed at Chiddingstone Castle Wedding Fair. Here's a real stunner - a rich chocolate, Madeira and lemon cake frosted with crusting vanilla buttercream and dressed with beautiful David Austin roses and trailing jasmine. 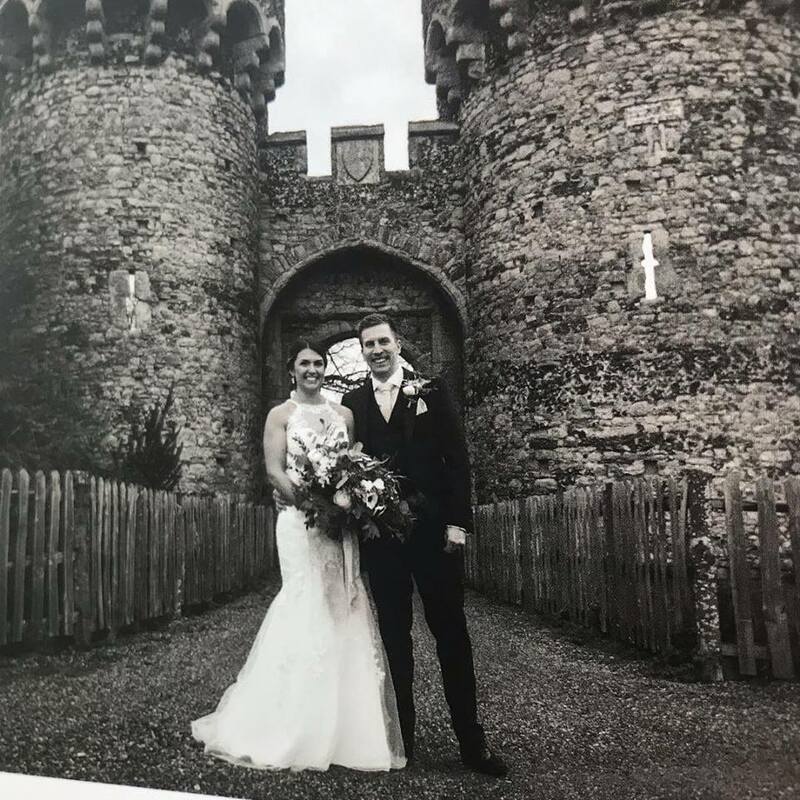 This was another joint effort, with florist Miranda Andrews, who supplied the flowers and showed me how to wire and tape them correctly, so that they would remain fresh, food safe and in place until the cake was cut at this Port Lympne wedding. 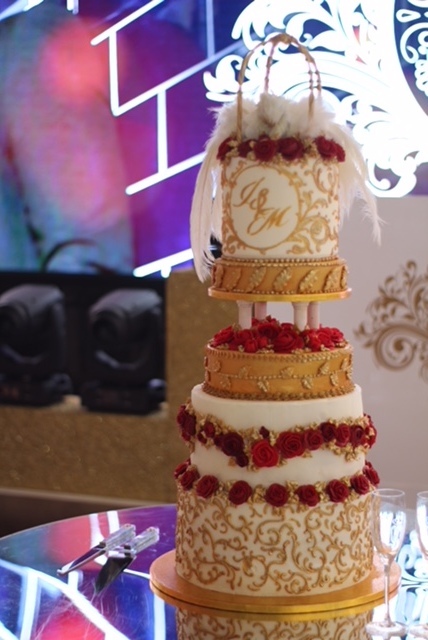 The cake complemented the table arrangements and the bride's bouquet perfectly. The couple are South African and wanted to use King Protea flowers as centrepieces, as they're the South African flower. You don't have to play safe with a neutral background. Look how effectively this hot pink buttercream rose swirl complements the pinks of this contemporary arrangement put together by local Westerham florist Jo Anne Hardy (of Posy & Wild). 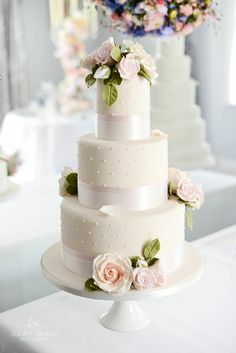 This shape can be achieved by stacking a cake dummy between two cake tiers so the flower stems can be inserted into the polystyrene, leaving the cakes intact. 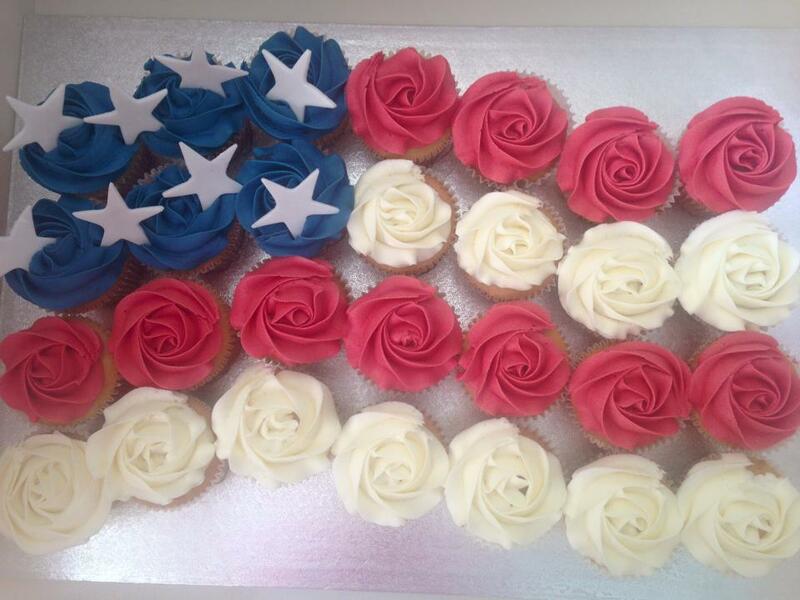 Or you could use an ombre effect to link your colours, like this American design here. For this to work, the frosting needs to be very carefully tinted so that the flowers and foliage are accents, rather than merely adorning an ombre cake. The strength in this design is that it reinforces the green of the ivy at the base and the pink of the roses on the top. If you can imagine a couple of pink blooms at the base, you'll probably agree that this would have completely confused the design, which would have had a stripy rather than ombre result. Very clever. I supply cakes to venues and florists to be dressed on site. Most florists will have dressed cakes with fresh flowers before, and will confidently tape the stems or insert them into plastic flower picks so that none of the sap can reach the cake itself. Obviously buttercream is soft, unlike fondant, and this poses a few challenges, particularly when draping foliage between tiers, but often all it needs is careful pinning. Never instruct a florist, events manager or caterer to dress a cake with barestemmed fresh flowers. Some cut flowers are toxic and all have to be properly prepared to ensure that they are foodsafe. So chuffed to be asked to judge the Churchill Primary School Easter cake competition. After having children at the school for 15 years, it's a pleasure to go back and visit. They made me feel like a proper celebrity - was allowed to draw the raffle and everything. And look at the cakes!!! This carrot patch masterpiece was made by a little dot in reception! All the carrots and the strips of lawn are piped in buttercream. Love the carrot tops piped with a star nozzle, and the chocolate soil. Very clever. More piping and meringues! 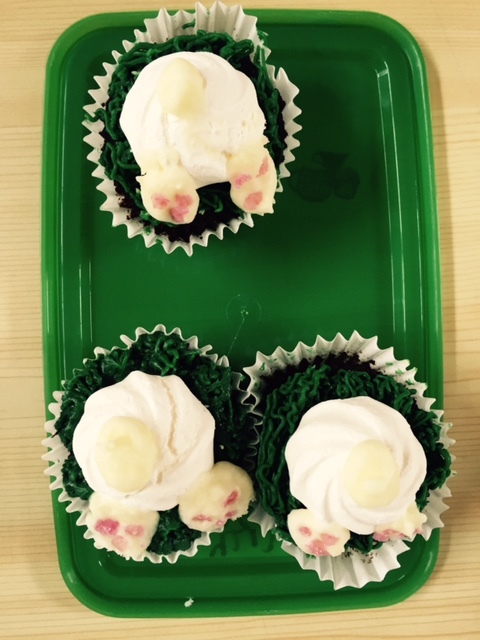 I made some bunny cakes a bit like this last year but didn't think to use meringues for the bottoms. Lots of skill here. Very cute. This must have taken ages. Lovely white clean fondant with no holes or chocolate finger prints! Piping again! Love this: full of character. Really brilliant design. Year 5 was the hardest group to judge. They'd all gone to such a lot of trouble. The designs were fantastic and they all looked delicious. One pupil even managed to produce a gravity-defying design with hundreds of mini eggs pouring out of a magically suspended Easter egg! Another ambitious design, from a year 6 pupil who's made three cakes of different colours, carefully cut them into cubes and painstakingly reassembled them to create a chequerboard pattern. Surprise inside cakes are very on trend so it's good to see the children of my town are out there pushing the boundaries of cake design! What a treat. Love them. I've been working on a lot of these recently. Tall buttercream covered tiers topped with a glossy chocolate drip and piled high with meringues, macarons and chocolate shards. Inspired by Sydney bakers Katharine Sabbath and Cakes by Cliff, these quirky designs are full of fun and character. They can be dressed up with fresh fruit, handmade chocolates, buttercream roses and touches of gold leaf, or taken to the party max with coloured popcorn, sprinkles, lollipops, sparklers and popping candy. The style of these cakes is chaotic, but the finish has to be immaculate. Think about height - this can be created with chocolate sails; simply spread melted chocolate over a sheet of greaseproof or waxed paper and slide a couple of rolling pins under the paper to produce an undulating profile. If you use Candy Melts there's no need to temper the chocolate, but you won't be able to add past colour without the candy seizing up. Use gel colour, or add a few drops of Wilton FloCoat to a paste colour to avoid this. Add piped buttercream roses for a whimsical rainbow effect. Meringues are tricky, The Meringue Girls add hot sugar (120g) to whisked egg whites (2), a spoonful at a time, to stabilise the egg and produce a smooth finish. I've had mixed, overcooked, results with this method (possibly because the oven was still too hot from heating the sugar) and have gone back to using cold sugar, still adding it very slowly, and stopping the mixer as soon as the mixture becomes stiff and glossy. Create stripes on your meringues, either by painting lines down the inside of your piping bags, or just by swirling colour around the bowl of mixture with a cocktail stick. Bake at 90 degrees C for an hour. Glossy fresh cherries and freeze-dried raspberries add depth of colour to this pink two-tier cake. A ganache drip needs to be glossy but not so liquid that it runs down the sides of the cake to the bottom. Put your frosted cake in the fridge and pour 100ml of hot whipping cream over 100g chopped plain chocolate (Sainsbury's Basics is perfect and 35p!) and whisk until smooth. When it's cooled down to room temperature, carefully drop teaspoons of the ganache around the edge of you cold cake and coax it over the edge with the side of the spoon every couple of centimetres. When you've gone all the way round you can fill in the middle and smooth it over with the back of the spoon. Really thrilled with the images from the Colour Pop photo shoot organised by Creative Brides in September for Wedding Ideas magazine. I love working with romantic imagery and faded vintage hues but it was so fun to work with some bright colours for a change. Sometimes I think couples associate bright colours with a contemporary setting, but see how well they work against a rustic backdrop! A fun cake topper like this star bunting from Pop Pop Papier is a really brilliant way of picking up the colours in your décor without replicating them on the cake itself. 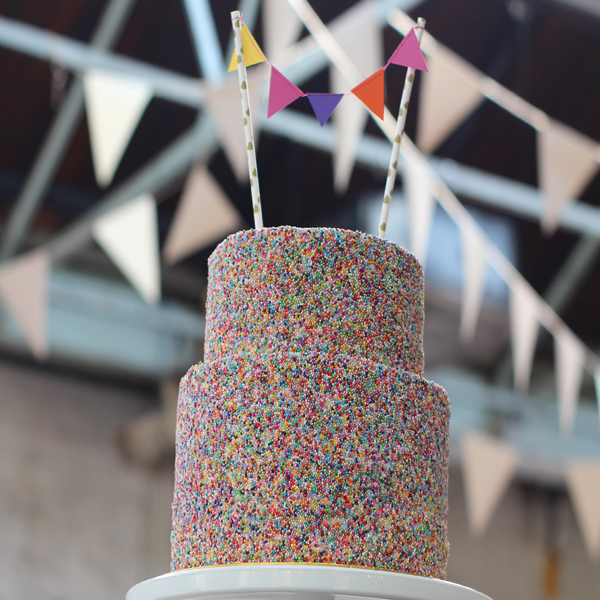 Sprinkle cakes go with any scheme and can be made in confetti sponge (Madeira with sprinkles actually running through the cake) for a sweet surprise crunch. Rainbow cake is a fun idea if you're opting for one tier. A plain rustic frosting is fine but really needs the addition of a topper to have some presence. Think about paper pompoms, tiny balloons, bunting (all available from Pop Pop Papier) or a perspex and glitter topper. These neon pearls are devilishly difficult to get hold of, but worth the search. They're an inspired mix - flouro pink, orange, grey, pastel green, red and black - which I would probably never have put together myself, but look how the colours pop against the white frosting!! 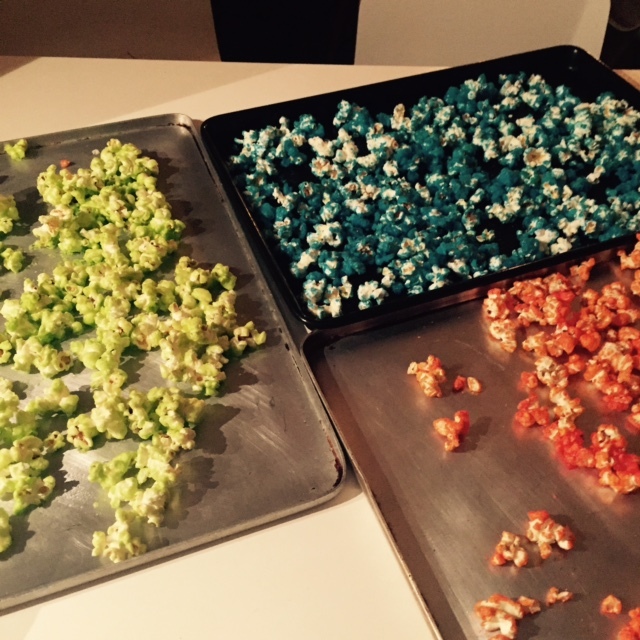 Rainbow popcorn makes a fun cake topper and is really quick to make. It also looks pretty in a jar or could be bagged up to make wedding favours. So dissolve the sugar and syrup in the water over a medium heat. When it's smooth quickly share it between four large bowls and add a drop of different colouring to each. Stir to get an even colour and then tip a quarter of your popcorn into each bowl. Stir around quickly to coat each piece of popcorn. Tip each other onto a different oven tray and bake for 10 minutes, until very crunchy. Careful when testing as the coating will be super hot. Ta da!! Only problem is we stored the blue popcorn in a jar that had previously been used for pickled onions, even though it had been sterilised. Bear in mind that popped corn is very porous and will pick up flavours very quickly! A cake design can be worked up from a fragment of material or lace, the flowers of a bouquet or even an architectural feature of a venue. 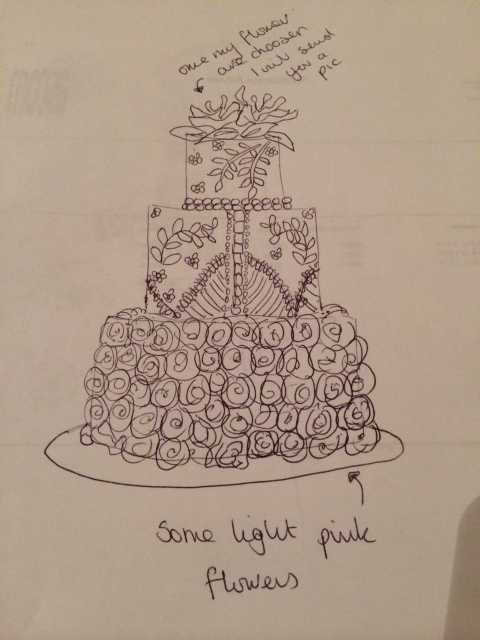 The bride who rather shyly presented me with this fabulous sketch wanted me to interpret the lace pattern of her wedding dress bodice in piped buttercream but knew that this level of throughout the three tiers would take the cake over her budget. I can't take any credit for her idea of covering the bottom tier in a simple rose swirl: a quick finish that combines a romantic shape with a contemporary rhythm, but I was thrilled with the coherence of the result. It demonstrates how the spirit of a design can be captured without duplicating it in full. This cake was made for a textile designer who has won several awards for creating a fabric design that is used for upholstery on yachts. The sketch is her initial draft of the design. I copied and piped the buttercream in a stitch pattern to give it an embroidered look. It's hugely helpful to start the design process with a fragment of fabric or a sketch. I've even worked up a wedding cake from a pillowcase design!